The pilot project will take Laney students from a range of programs to the Global South where Master’s in Development Practice students currently conduct their fieldwork. 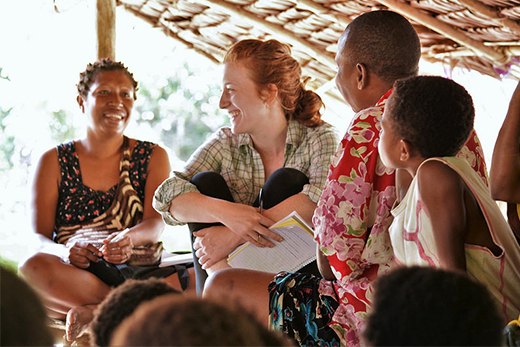 Here, student Jillian Kenny works with The Nature Conservancy's Papua New Guinea Forest Program. Photo by Nathan Kennedy. The Henry Luce Foundation’s Higher Education Program recently awarded the Laney Graduate School (LGS) a special grant to pilot a new project for developing global skills in doctoral education. The project, "Global Skills: New Rubrics, New Structures," will be led by co-principal investigators LGS Dean Lisa A. Tedesco and David Nugent, professor of anthropology and director of the LGS Master’s in Development Practice (MDP) program. Carla Roncoli, associate director of the MDP program, will also contribute to leading the project. The project seeks to address a gap in current academic training, which often leaves graduate students unevenly prepared for the central role culture, values and beliefs play in shaping everyday understandings and decision-making processes of people across the globe. “There is growing interest among students, faculty, administrators, policymakers and the general public to see higher education as transformative in addressing complex problems," Tedesco says. Though universities are increasingly seeking to develop understanding and impart skills needed to participate effectively in today’s globalized world, university structures can present barriers. “Longstanding disciplinary and departmental boundaries can make it sometimes difficult for students to develop the conceptual or analytical tools they need to address today’s global problems," Roncoli notes. Nugent agrees. “Doctoral students are not often provided with practical experience in working with organizations that seek solutions to global poverty, food security, climate change, population displacements and health threats,” he says. Building a "community of practice"
To overcome these challenges, LGS will pilot an innovation in the field of global education in the form of an interdisciplinary "community of practice," or COP. One goal of this pilot is to help students to recognize the applications for their expertise and to learn to deploy it more broadly outside of their scholarly fields. The COP will transcend program, department and school by including students from the MDP program, which trains development practitioners, as well as students from Emory’s other professional masters programs and PhD students from across the humanities, social sciences, public health sciences, and the natural and biomedical sciences. Comprised of 16-20 students, the COP will also include representatives from partner organizations that are involved in cutting edge development practice, applied research and capacity building, such as CARE, The Carter Center, Habitat for Humanity, and the Nature Conservancy. The COP will work under the supervision of faculty who have interests and expertise in problems that have global orientations. “The pilot COP will bring to the table students with significantly different needs, interests and capacities in terms of their positioning along the academic/applied and utilitarian/cultural divides," Nugent explains. The pilot COP will operate for 18 months and will involve fieldwork to address practical problems in the Global South. Team members will go to the field and implement the project they plan during the academic year in collaboration with a partner organization. Upon returning from the field in the fall, the student team will participate in a “return seminar”: With guidance from participating faculty, the team will engage in a structured critique and reflection of every stage of the project, from planning to implementation, and will develop recommendations for improvement. At the conclusion of the pilot, the team will produce a final assessment of their efforts, which will inform the work of subsequent COPs. “The novel activities of the COPs will make it possible to identify important new understandings that are necessary to transform graduate education, so that it is in tune with the needs of the present era," Nugent says. Assessment will be a key part of the pilot, Tedesco says. Addressing "the world's most pressing problems"
Keen on monitoring this project as it unfolds is Emory’s Office of Global Strategy and Initiatives, responsible for implementing Emory’s global strategy, including innovative advances for international programs, curricula and research. The Henry Luce Foundation sees value in this project beyond Emory. The project will launch in fall 2016.